So instead of bringing a round-up of each day, I thought I’d summarise some of the best places we found to eat around the city. I came across Cantinetta frequently when searching for a good Italian, and it seemed to have a great reputation amongst locals. Not too far from where we stayed, you’ll find it in Oud-West. Cantinetta is very small and veeery busy, with some long waits for food (we ate pasta at 11pm after originally turning up around 8:45pm). However, the food was worth the wait. We ordered fried potatoes as a sharer, which were tossed in oil, garlic, rosemary and lemon. Next, I went for the Marina Romana Con Ricotta: fresh pasta with tomato, onion, garlic, ricotta and pecorino. The menu has an option to add in two handmade meatballs too, so of course I did. A few years ago, I’d probably have told you I didn’t know the difference between fresh and dried pasta (sorry), but these days I’m obsessed. This was so fresh and rich, I could have happily just drizzled some oil on it and eaten a bowlful. The ricotta was probably the best I’ve ever tasted, adding a gorgeous creaminess to the dish that was a delight with the garlic and pecorino. And the meatballs were huge! What I loved most was how the pasta wasn’t drowned in sauce, really putting the craftsmanship of the pasta into the limelight. Final verdict: a bustling locals’ favourite and definite third place. Go for the delicious pasta and amazingly friendly staff, but do be prepared for a lengthy evening. Thrill Grill was a hasty plan B. We headed into the De Pijp neighbourhood in search of The Butcher, a renowned local burger chain, to find it was tiny and rammed for our party of 5. Luckily, my extensive research equipped us with options, and we hotfooted it around the corner to Thrill Grill. Much more an industrial style burger restaurant, the vibe was better suited for a larger group. Thrill Grill boast 100% good food, being locally sourced and additive-free. Whilst most talked about for their burgers, the vast menu encompasses a good amount of grilled meat, fish, smaller bites and veggie options – incidentally, a friend had the chicken and said it might have been the best he’d ever had. Torn between the Classic Beef Thriller and a Blue Cheese Kranenburger, I went for the classic because of its bacon and gouda combination. We also ordered a plate of truffle parmesan fries (I lit up when I saw this on the menu) and cheese croquettes to share. The beef burgers here are served medium rare (IMO the best way) and are incredibly juicy. Packed full, with a great combination of textures, it made for a great burger – although I was a little disappointed by the bun. The fries come in a huge portion, drizzled in truffle oil and absolutely covered in parmesan with truffle mayo on the side. Even after I was full I couldn’t stop going for these. Finally the croquettes, which were like molten LAVA. Honestly, even about twenty minutes later they were scorching inside so be warned! Not as cheesy as you might expect, these actually pack a rather mustardy flavour (similar to bitterballen, a popular snack across Holland). Final verdict: Fast and friendly service, great grill menu and sides – check it out. 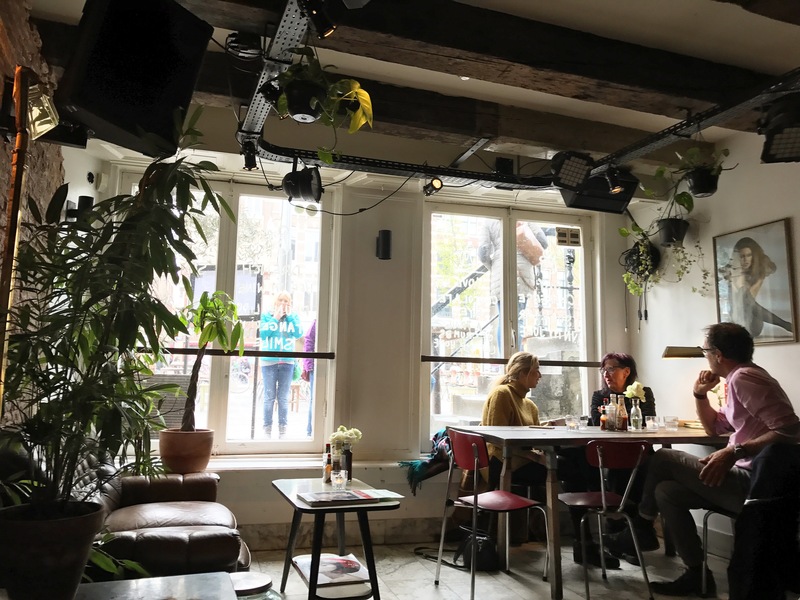 An example of having to find a plan C, it seems EVERYONE in Amsterdam loves brunch. This one was actually found by Brandon after several desperate searches, and sits very centrally near to the Red Light District. With a cool, botanical air, Metropolitain was a relief after wandering the city for so long. I chose the “Famous” French toast with added bacon and a flat white. The french toast was beautiful, topped with red berries and accompanied with yoghurt and maple syrup. It was difficult to eat however, with bacon and syrup constantly sliding off the board onto the table! So points off for that. Whilst really tasty and generous with toppings, it was a little on the luke warm side too. The coffee was crap. I really struggled to enjoy a single coffee I had in Amsterdam, which is strange as so many people rave about it. Admittedly, I didn’t manage to get out to any proper coffee shops or roasters, but the lack of good coffee amongst brunch spots was a disappointment. Final verdict: Well presented food and pretty tasty, if not slightly inconsistent – wouldn’t go out of my way for. La Perla frequently came up as one of the best pizzerias in the city, so one evening we walked to neighbouring Jordaan to check it out. Incidentally, Jordaan is an absolutely stunning neighbourhood, and I would fully recommend taking a trip there just to take it in. As it happens, La Perla is also incredibly popular with the locals and again, we endured a rather long wait. We sat outside with a couple of Aperols and watched the servers running back and forth across the street all night: La Perla is split across two buildings, with one restaurant and one takeaway shop housing the pizza oven. We were welcomed inside with complimentary drinks for the wait, and eagerly perused the menu. 11 different pizzas to choose from was a struggle by this point, so Brandon and I decided to share two different ones. The Porchetta di Ariccia was topped with tomato, fresh buffalo mozzarella, rocket and brick oven roasted pig from Ariccia. Meanwhile, the Salsiccia Fresca came with tomato, radicchio, fresh sausage made by a family in Tuscany, mozzarella and stracchino (a lovely creamy cheese that is almost a cross between mozzarella and ricotta). If I had to choose a favourite, I think it would be the Salsiccia by a pinch and mostly for the amount of cheese. We ate in feverish silence, speaking mostly to convey our approval. The quality of the ingredients used was clear, with gorgeous creamy cheese and tender pork. Final verdict: best food of the trip! Proper local-sy feeling third place. Go go go. We tried to go to TEDS the morning of Metropolitain and couldn’t even wait for a table, it was so busy. About three minutes around the corner from our apartment in Oud-West, I was desperate to try again. On our last morning, we made it there and got seated immediately – thank goodness for Mondays eh? After my good-but-not-amazing french toast the day before, I decided to try again here whilst Brandon chose a Philly Steak sandwich. Another flat white, another disaster – I won’t bother to talk about my millionth disappointing coffee experience. The french toast totally hit the spot this time. Drenched in syrup, with a great cinnamony taste from the bread and topped with salty bacon, I inhaled my plate. Brandon’s Philly Steak was delicious, with cheddar, jalapeño mayo and onions sliding all over the place. The wholewheat sourdough bread had a great chewy texture and crusty outer, and if I’m honest I was a little jealous. TEDS has a cool interior but keeps it fun, with sarcastic prints and obscure photos dotted all over the place. Final verdict: A great brunch menu in pleasant surroundings, and the best brunch of the trip! Definitely worth a visit. I’m just as in love with Amsterdam as much as I was when I first visited in 2014, and can’t wait to go back again (if not just to find a decent flat white!). We made the most of our trip by walking pretty much everywhere, taking in all the crooked houses and breathtaking canals. This time around, I’m glad my tastes in food have developed so much, as the eating experiences were so much more than your typical centre of town tourist traps. Have you been to Amsterdam before? Do you have a favourite restaurant, coffee shop or brunch spot?